Heat oven to 375°F. Spray 13x9-inch (3-quart) glass baking dish with cooking spray. Peel, halve lengthwise and seed squash; cut into 1/2-inch-thick slices. Arrange with slices overlapping slightly in bottom of baking dish. To make ahead, prepare the recipe through step 4. Cover and refrigerate for up to 24 hours. 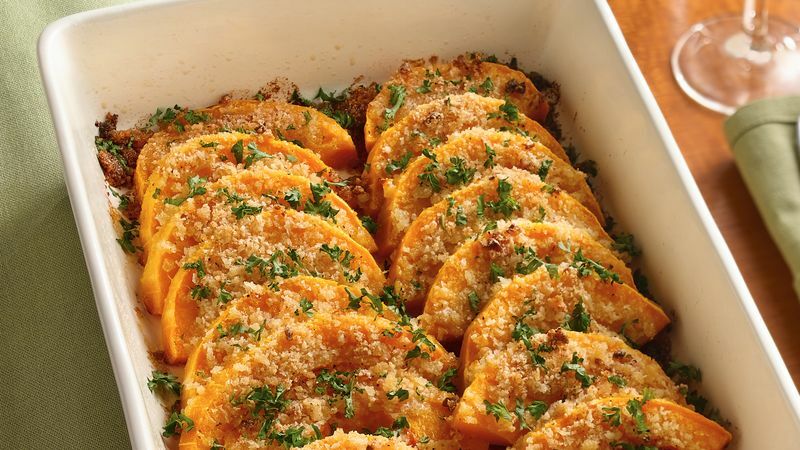 Butternut squash is a tan-colored, elongated vegetable with a bulbous end and mildly sweet flavor. When selecting butternut squash, look for those that have hard, tough rinds and are heavy for their size.